A wonderful house - wonderfully situated. The links below show the floor plan, the villa's location on the island, many lovely photos and even a video walk-through which is a treat. How lovely, light and airy it all looks, perfect for that holiday in the sun. 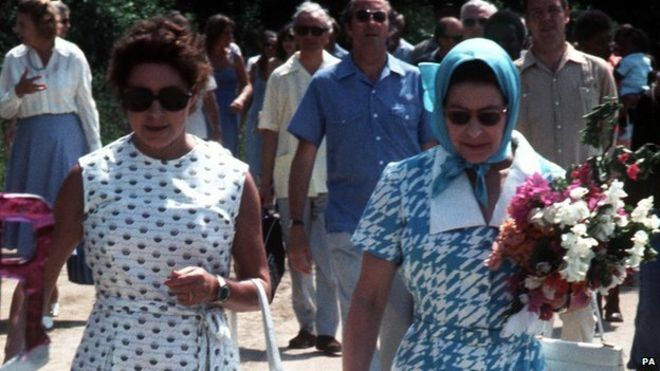 Princess Margaret loved the villa so much, it's a shame lord Snowden wasn't so keen. I suppose it's changed a great deal since Margaret's day. I wonder whether the Middletons/Cambridges have ever considered renting it? If my memory is correct, Lord Glenconner gifted it to Margaret alone, as a wedding present which miffed Snowden further. They were already not friends prior to that. Glenconner used to call Snowden Tony Snapshot. A bit has been changed since Princess Margaret's day Curryong - mostly the furnishings. One is quite well-known, but the others I haven't seen before and it's nice to see her in different parts of her home. MArgaret must have loved the place very much, and no wonder. I can remember reading about her parties there. Plenty of room inside and out, with two large swimming pools. It looks divine. Thanks for posting, Sun Lion. Here's an article that has Colin Tennant explaining that it was his in-laws who put Princess Margaret's future husband off-side Daenerys Targaryen. Lots of interesting details such as Margaret and Colin constantly moving the boundaries of Les Jolies Eaux - she to increase it, he to decrease it - and of Roddy Lewellyn designing and planting the garden there. Also, various high-jinks on Mustique that were not known by the greater public at the time, but which have since come to light. There is an interesting explanation of the formal Edwardian suits, dresses, ostrich-feathered hats and parasols worn by the locals when The Queen made her visit, and how this came to be. And it was at Les Jolies Eaux that the Princess scalded her feet, and this article explains how that happened. And here are a couple of photos I took when I was at Kensington Palace in 2014. 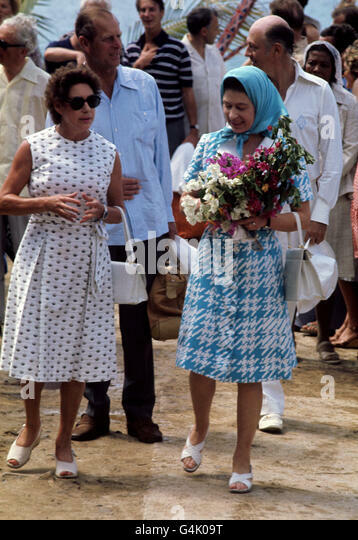 This was the outfit Princess Margaret wore at a famous, and much-photographed, party on Mustique. 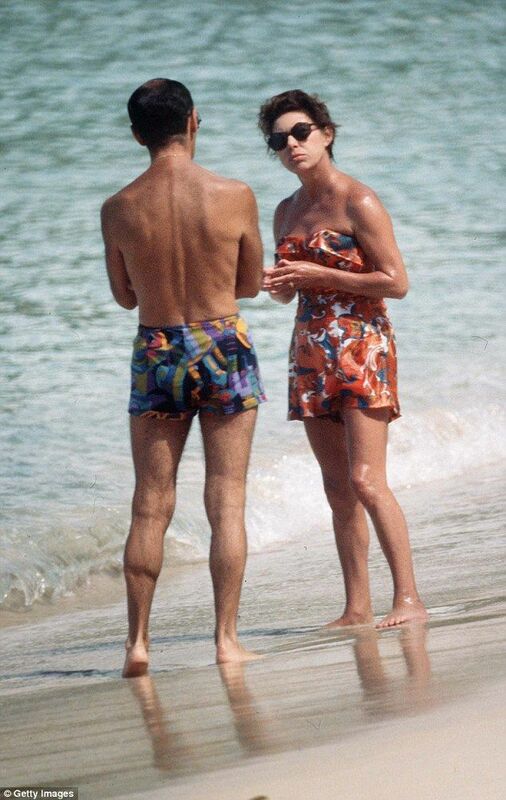 Anyone not around at the time may not realise the amount of newsprint that was expended on "outrage" - for want of a better term - at Margaret's holidaying life-style and secret/not so secret relationships. And now, to me, to see this "Mustique" outfit on official display at Kensington Palace - well it shows how times have changed since then. P.S. These links are to a photo of the curators setting up the turban and kaftan display at Kensington Palace - which was lent for the exhibition by her son and daughter - and a close up of the turban. Absolutely! Margaret loved a good party with friends around her, and Mustique was a wonderful place to go a bit wild. Of course, in a much more conservative era, that was a source of outrage by press and public. I do remember the huge brouhaha over Roddy Llewellen at the time. That scandal gave Tony Snowden a 'get out of jail' card, and a divorce soon followed. Margaret must have really loved her villa and it's such a shame in a way that Visvount Linley decided to sell it. A nice first-hand account of staying at Les Jolies Eaux and some insight into the island's life-style. 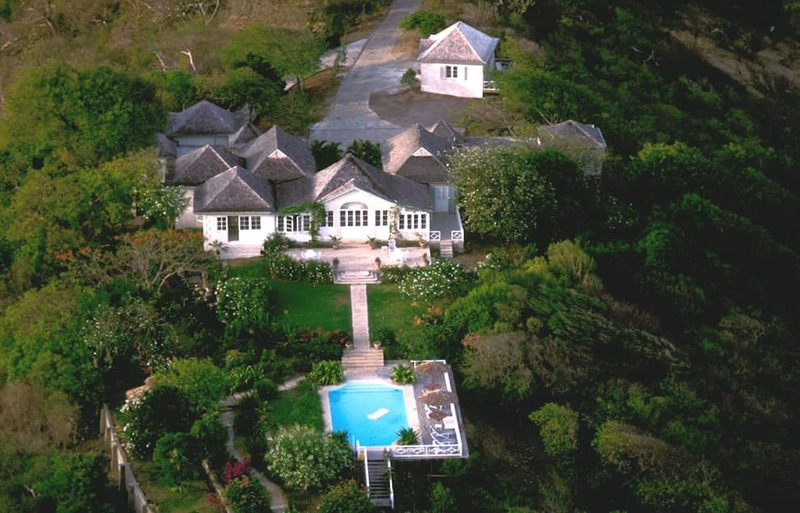 And journalist Liz Smith stayed on Mustique in 2014. 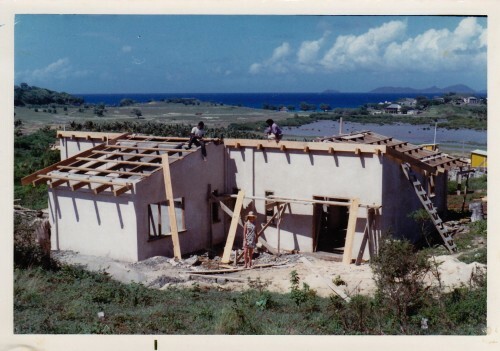 Some photos of Margaret on Mustique. Love the photographs from the 1977 Silver Jubilee visit and David is the image of his late father. Two aerial photos Curryong showing changes to the buildings since Princess Margaret's time. A lovely photo of mother and son An Ard Ri. Royal relative Lord Lichfield visited Mustique. 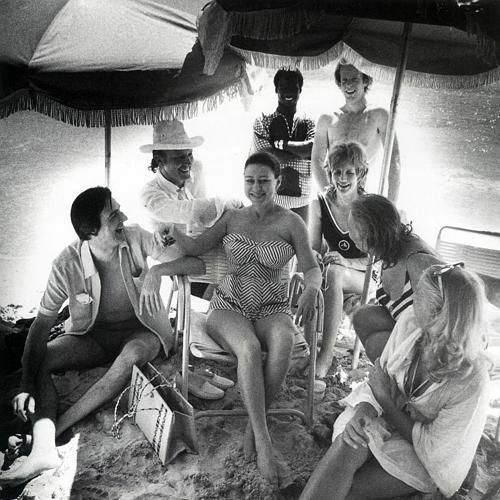 A photo of Princess Margaret on Mustique taken by Robert Mapplethorpe. 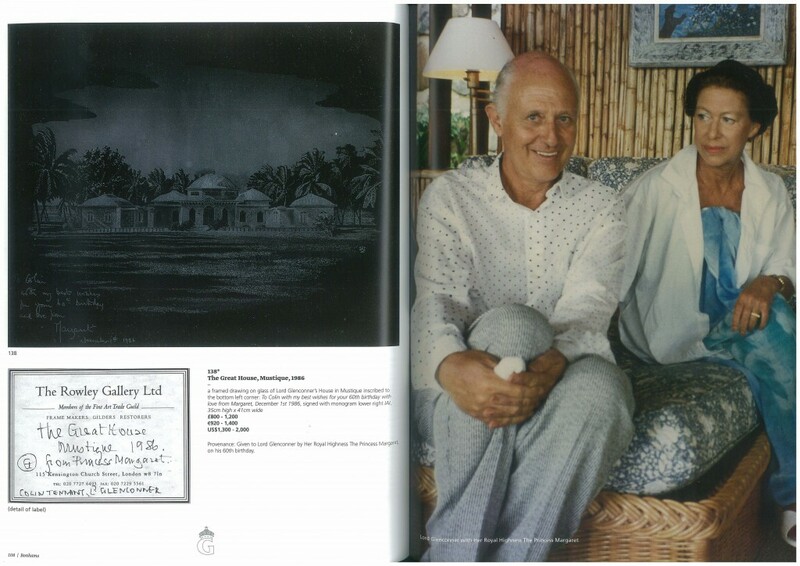 And an old interview with Lord Lichfield - who also owned a house on Mustique - telling how cooking was done on camp stoves when Princess Margaret first arrived, as their was no electricity, and a few other interestig things. Margaret looks as if she is ready to hold court with her friends beside the pool in this photograph. She looks deeply tanned, but of course people didn't worry about the sun's effects so much in those days. I can definitely see her son, the new Earl Snowdon, in her features here. So true about the sun Curryong. 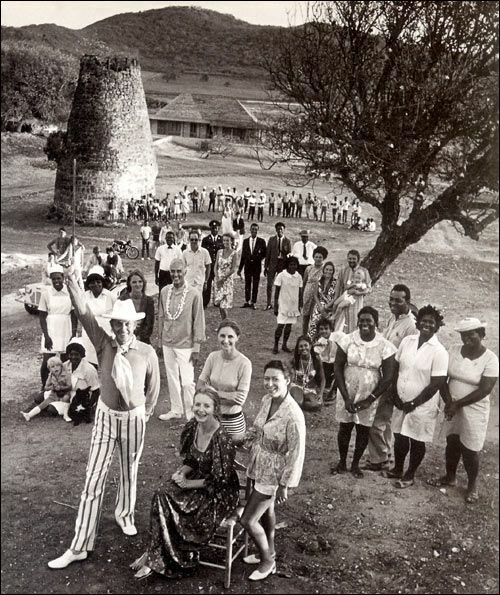 And here is another group photo taken on Mustique - this time with Princess Margaret, in the foreground, and with her son and daughter-in-law behind her. 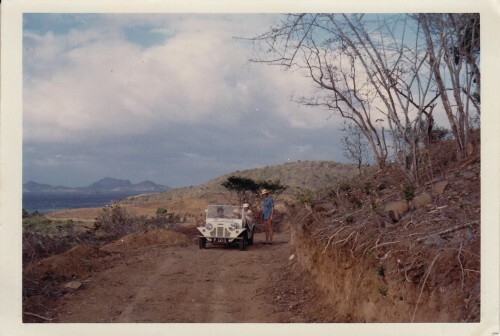 And a photo of Lord Lichfield on Mustique. In the interiew above, where he relates the extreme accident he had on the island, he tells how his house on Mustique wasn't far from the Princess's house. 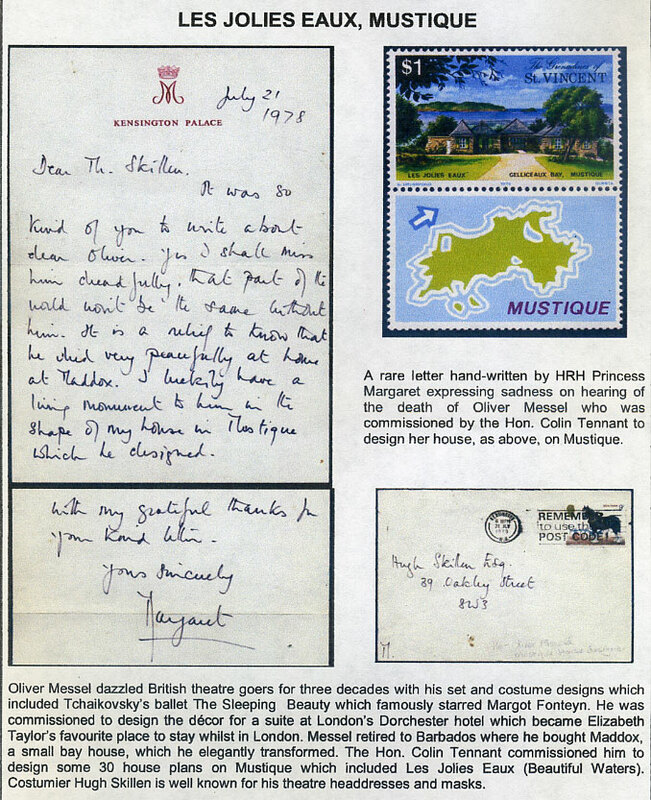 For his sixtieth birthday, Princess Margaret gave Colin Tennant a drawing of his Mustique house etched on glass. 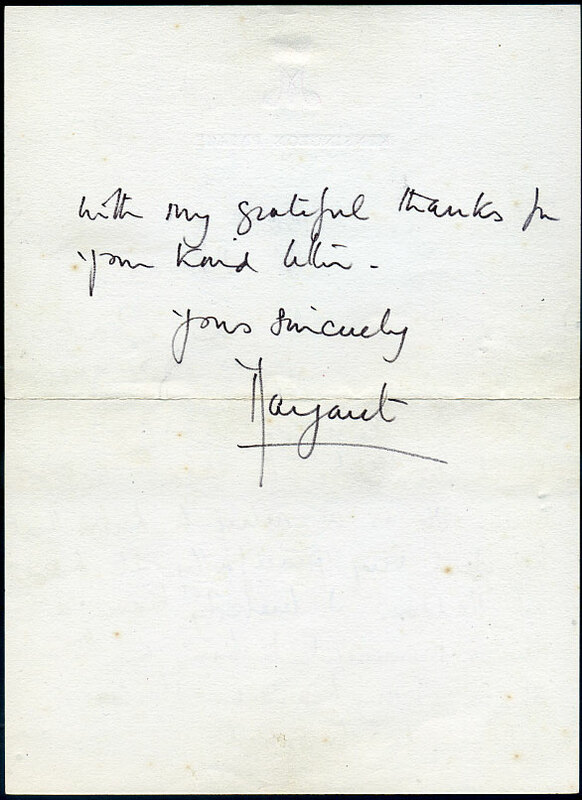 Her birthday wishes and signature are on the lower corner. Some paintings of Les Jolies Eaux by artist Nicholas Hely Hutchison. 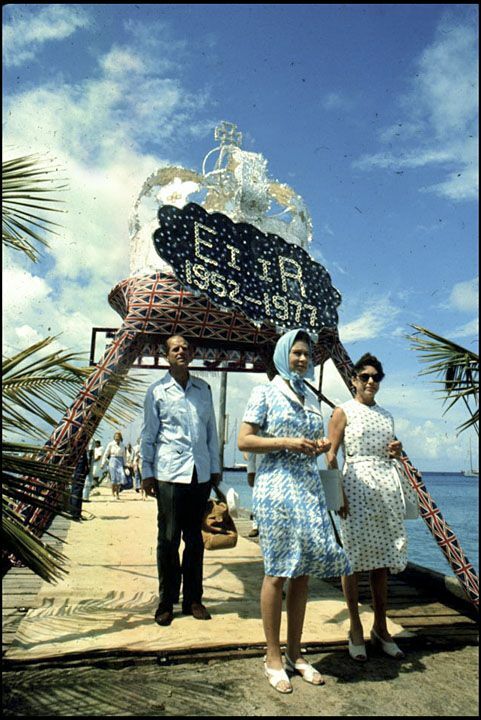 A photo of Princess Margaret on Macaroni Beach Mustique. Colin Tennant is on one side and his wife Anne - a lady-in-waiting to Margaret - is on the other. That is a dish of macaroni cheese in front of them! A nice video of Macaroni Beach from more recent times. 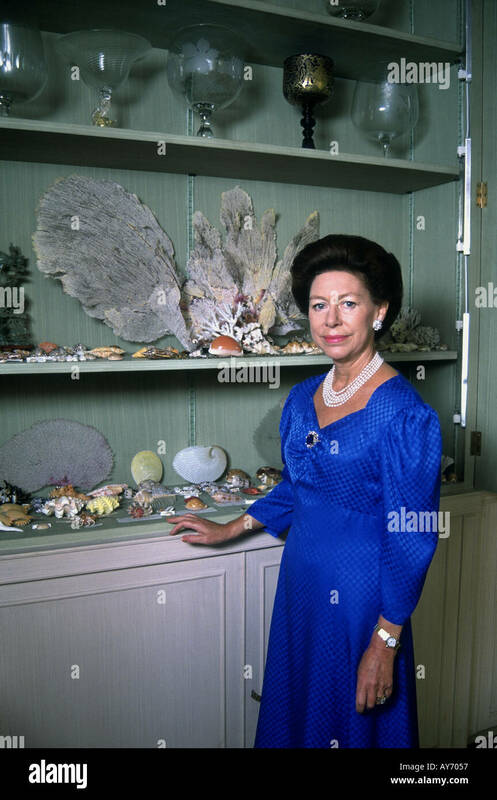 A photo of Princess Margaret taken at her Kensington Palace apartment, showing her love of the sea. 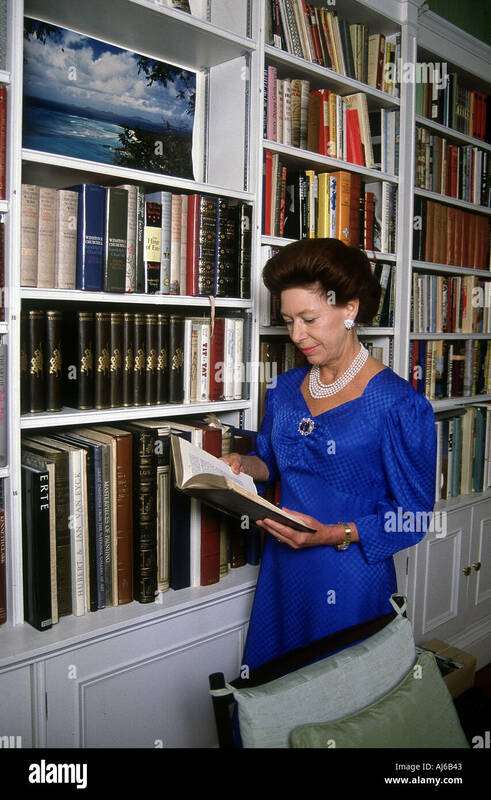 And in her library at Kensington Palace - see the photo on the shelf. The view from Les Jolies Eaux? Les Jolies Eaux before the house was updated - Princess Margaret's son Viscount Linley on the edge of the pool wearing the red swimwear. 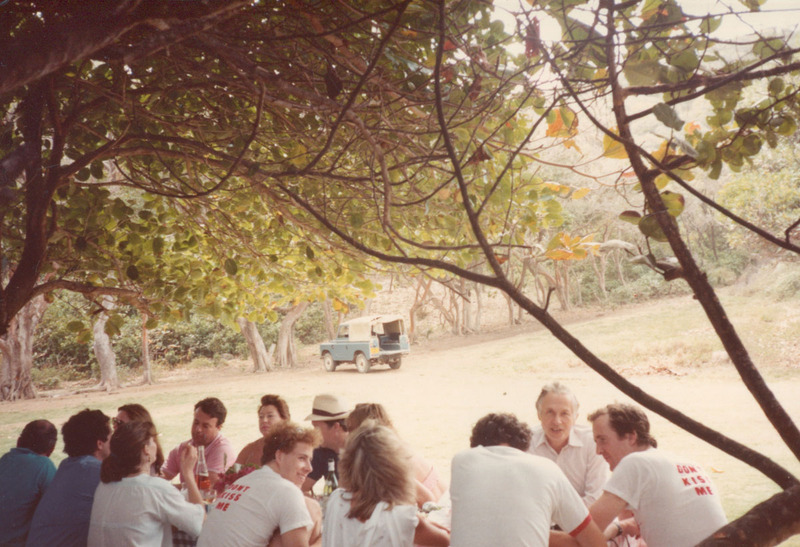 A group meal on Mustique - Princess Margaret on one side of the table, with her son opposite her on the other. 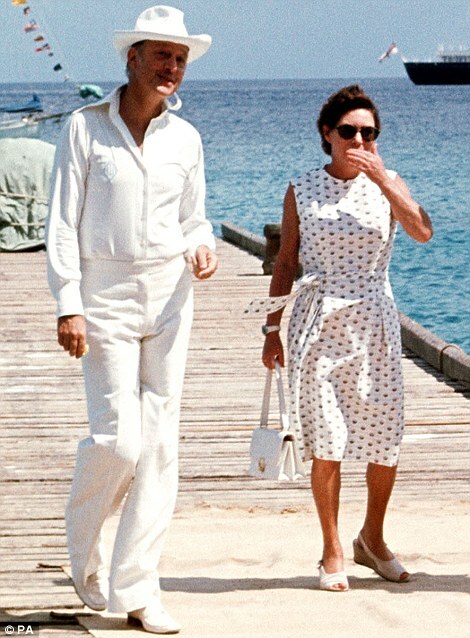 Princess Margaret and Colin Tennant on Mustique. 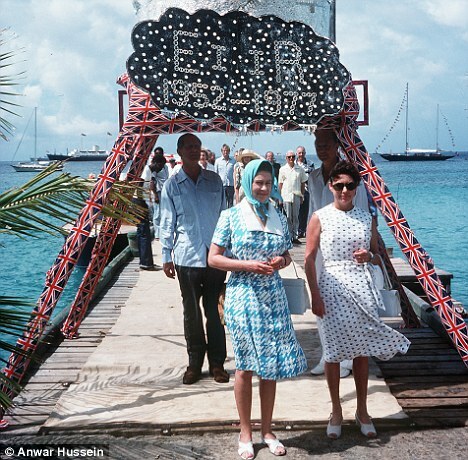 Photos and an interesting article about life on Mustique in the late 60s to early 70s - quite different to today - and an a bit of an insight into how the island was in Princess Margaret's time. 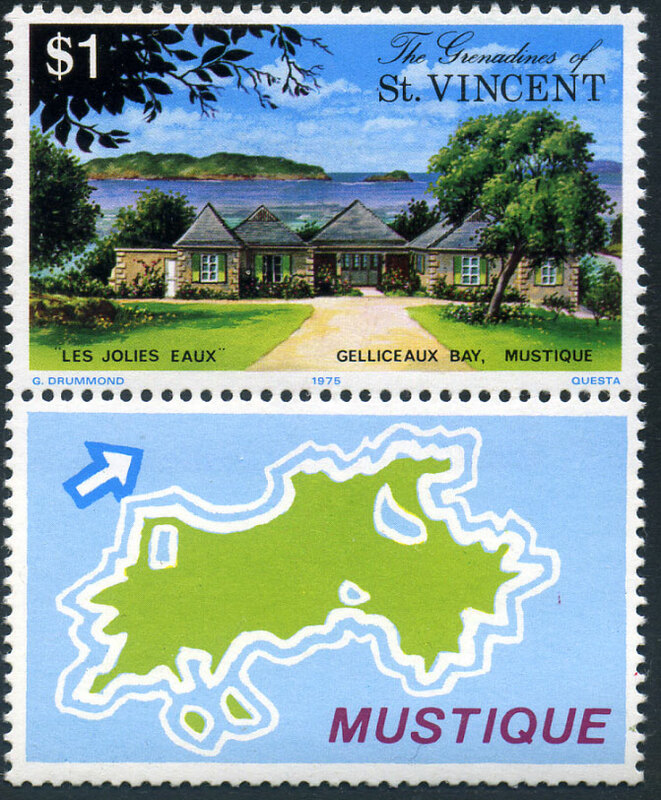 A Mustique postage stamp featuring Princess Margaret's house Les Jolies Eaux. 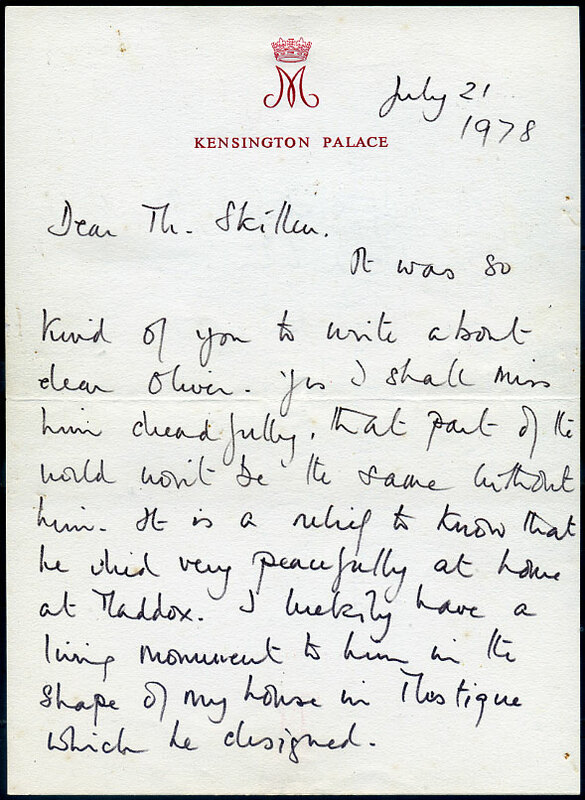 A hand-written letter from Princess Margaret about the creator - Mr Oliver Messel, uncle of Lord Snowdon - of her Mustique house Les Jolies Eaux.